When we arrived we got a local tuk tuk to our hotel goodwill. It was a good location we stayed for a few days. We found nice local places to eat around the area. We hired a local motorbike taxi to take us around. The backdrop in Krabi is just limestone mountains. I have never seen anything like this before in my life. Views were amazing. Its really green really peaceful here. 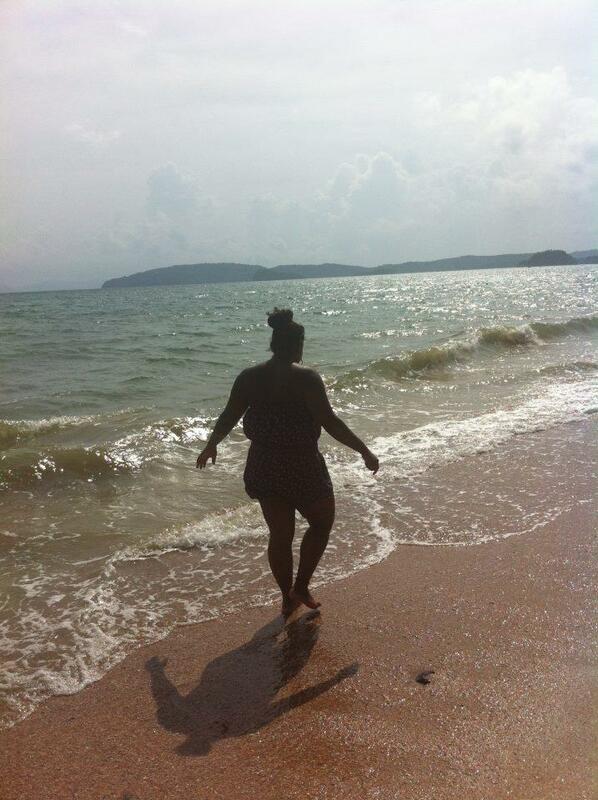 We checked out Ao Nang beach too which was quiet but beautiful. One day we were hand washing our clothes and Angelcia went to hang them on the balcony to dry and walked straight into the balcony door (beacuse it was so clean it looked like it was open) and the door fell off its hinges. haha. We couldnt get it back on. We tried and tried and were so lucky it didnt smash otherwise the room bill would have been soooo expensive. So i put it back on made Angelica hold it but if we let go it would fall. I told reception our door wouldnt shut so they came up held it and it fell off. They thought they done it hahaha so maintenance came and fixed it. So so funny. We then thought best leave and check out Krabi Town.